Take a stroll down Orlando’s indie side. Its offbeat, authentic, crave-able, bikeable side—the culturally casual side that weaves together art museums and renegade retro retailers. Novel Ivanhoe Village restaurants and watering holes are fused by the warm lake breezes flowing from downtown’s liquid playground. Lucky visitors enjoy the happiest of hours overlooking neon sunsets that tease the distant rush hour traffic. Lines are happily blurred between antique shopping and wine garden tastings. 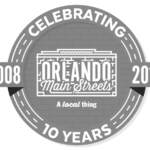 Orlando is filled with great districts and neighborhoods. Ours is just a little bit more unapologetic than most.